Army's 221st Station Hospital which became the 1389th Army Air Force Base Unit Hospital and then the USAF's 1604th Hospital. Southside, St. David's. Vacated when US Military left Bermuda in 1995. Never re-tenanted. Photos by this author, January 18, 2002, are of the fourth and last Kindley AFB/US NAS Hospital. Now Historic photos as buildings were destroyed to make way for the Bermuda Hospital Board's civilian Lamb Foggo Urgent Care Centre at Southside, St. David's, completed in April 2009. April 1941. Medical facilities for US forces in Bermuda began when the military ship transport "American Legion" docked with the first US troops bound for what was initially the US Army's Fort Bell. 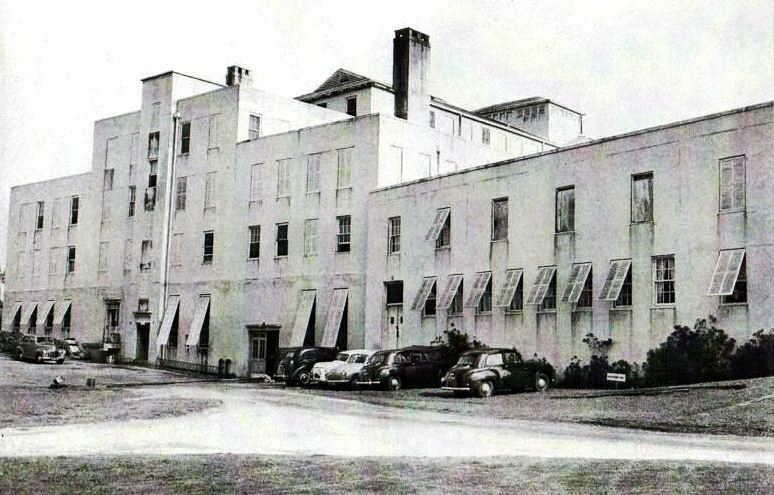 American troops who began their Bermuda sojourn by staying at the Castle Harbour Hotel during construction from scratch of the base brought with them the very first American hospital facility to set up operations in Bermuda. They had a medical contingent of eight officers and 64 enlisted men. What they established on the first floor of the hotel was in reality an infirmary, not a hospital per se. June 1941. 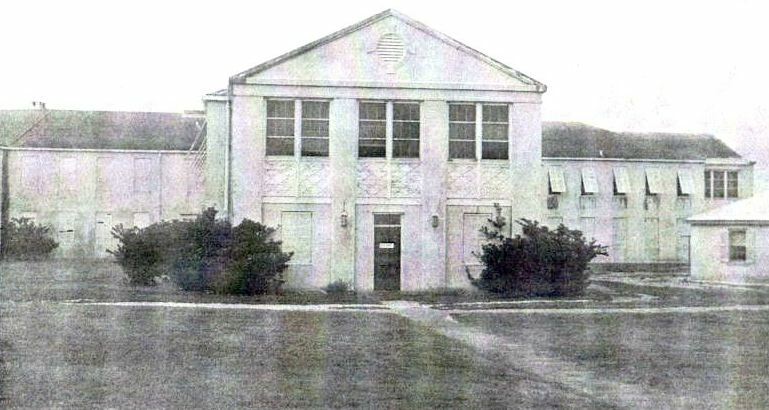 The American Government obtained a lease of the buildings and grounds of the Bermuda Biological Station for Research at Ferry Reach (with the biologists re-housed at the Government Aquarium, Flatts). A temporary American military hospital was established there. It was staffed by four physicians, a dentist and nurses, all US Army personnel. It was responsible for all members of the US Army Engineers and the thousands of workers involved in the building of the Fort Bell/Kindley Field Base. October 1941. Work was begun by US Army Engineers on the building of an elaborate 150-bed permanent US Army hospital at Fort Bell. It was the same site on which the present, much-newer, hospital, photographed above, stood until demolished in 2009. April 19, 1942. A detachment of the US Army's Airways Communications Systems arrived in Bermuda. It coincided with the decision taken to slow down substantially the building of the Fort Bell/Kindley Field base hospital. Official American military accounts state that the slow-down was due to the entry of the United States into the war and the complex logistics involved in having too few men, machines and transports to spare from other much more urgent duties connected with the shipping and supply of war materials. Plans for the massive building were stripped to the bone, as the entry of the United States in the war and attendant shipping and supply difficulties called for a drastic curtailment of all construction. The base hospital was intended to be camouflaged to look exactly like a large Bermuda hotel. February 1943. The building of the hospital, continued on an austere basis, was completed but contained only the bare essentials. But it cost more than $1 million. At that time, the hospital was run by U.S. Army medical people. In addition to the big hospital, a dispensary was also operated in a wooden building which stood opposite building P—30. May 1943. The first base hospital at Fort Bell was finally completed as the 221st Station Hospital, but had only with the bare essentials, notwithstanding its price-tag of more than $1 million. But there were sufficient facilities at the new site to justify giving plenty of notice in advance of the closure of the infirmary at the Castle Harbour Hotel and the temporary hospital located at the Bermuda Biological Station. May 1943 onward. When the Riddell's Bay Golf Club was a US Navy recreation centre during the war, a mobile hospital for the war-wounded was established nearby. It saved the lives of many brought in from torpedoed ships. Others were brought in to the Royal Navy Hospital just outside Dockyard (now Lefroy House). December 30, 1943. 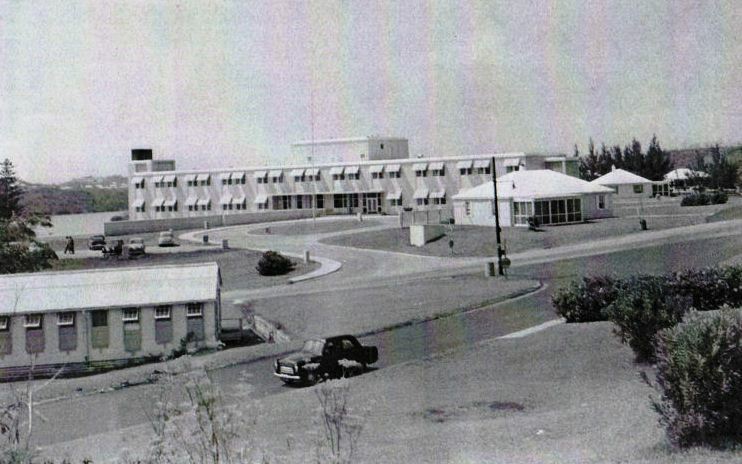 With the final completion of the first purpose-built hospital at Kindley, the infirmary that had been established at the Castle Harbour Hotel was finally closed out and the hospital facility that had been in operation at the Bermuda Biological Station was also shut down. February 1944. After the arrival on a regular basis of the first units of the US Army Air Force the first flight surgeon was assigned to the Bermuda US military hospital to take care of the specialized field of flight medicine. For his first year, he was definitely a man on the move. He first set up business in a suite in the hospital, but a month later it was decided to have his office in the operations building as more convenient for flying personnel. During the whole of 1944 and continuing through much of 1945, the United States' Kindley Air Force Base in Bermuda was a major refueling and rest stop for hundreds of medical air evacuation flights that carried wounded US servicemen from the European battle lines back to the USA. Between 1,000 and 1,800 patients a month were treated and housed temporarily at the Base Hospital - and attended to by the 830th Medical Air Evacuation Squadron, members of the US Women's Army Air Corps and American Red Cross representatives. Many of the air-evacuation flights, complete with flight teams of nurses and skilled technicians, flew into Bermuda from the Azores. July 1944. One of the more famous but in many respects least known to the public patients at the new US Army and US Army Air Force hospital in Bermuda, after his submarine U505 (now in a Chicago museum) was captured by the US Navy and brought initially to the Naval Operating Base in Bermuda, was its captain, Oberleutnant Harald Lange. He incurred a broken leg in the capture of his vessel, which had to be amputated. He spent some time at the Base Hospital and up to six months under special guard in Bermuda. He was not even allowed to communicate with his anxious wife back home in Germany. He was reported as having been very ashamed of having been captured alive and took personal blame for allowing his crew and vessel to fall into the hands of the Allies. His U-boat was commissioned in August 1941. She was on her 12th patrol, having sunk eight vessels over those voyages. In February 1944, Lange had taken the U-boat south to the sea lanes off southwest Africa to prey on supply vessels bound for Europe with supplies such as iron ore. On June 4, she was intercepted by TF 22.3 under the command of Captain Daniel Gallery, USN and was depth-charged. Lange brought the damaged boat to the surface to save his men and thus surrendered, actions for which he was for a time after the war ostracized at Hamburg, although they had taken all standard procedures to scuttle the boat. Captain Gallery, USN, of Task Force 22.3 managed to get a boarding crew onto the U-505 before it could sink and they saved the boat intact. It was the first time since 1815 that the US Navy had captured an enemy vessel at sea. The men of TF 22.3 were sworn in writing to secrecy and the boat was towed across the Atlantic by USS Abnaki to the US Naval Operating Base at Bermuda, accompanied by the ships of TF 22.3, USS Guadalcanal, Chatelain, Pillsbury and Pope. The U-505 was destined to become one of the most famous submarines of the war, not only for its capture with secret code books and machines intact, but for its enduring presence as a memorial to men lost at sea as a major museum exhibit. The U-505 departed Bermuda for the Philadelphia Navy Yard on May 20, 1945 after 11 months undetected in the Great Sound, the crew having left for POW camps in the United States in the autumn of 1944. Oberleutnant Lange had been taken from the water unconscious and severely injured and at Bermuda a leg had to be amputated, so he remained here longer. While in Bermuda, Lange was cared for by a young nurse of the Jones family of 'Inwood', Shirley, the late wife of Lt. James Humphreys, USNR, of Paget. October 1944. The Flight Surgeon moved to a room in one of the permanent barracks. December 1944. The Flight Surgeon moved back to the hospital because of the ever-increasing workload brought on by the growing number of transient aircrews coming through Kindley, for which he needed more room. January 1945. The new 105-bed hospital at Kindley was a Godsend and crammed to the rafters when the US Army hospital ship Charleston ran aground on a reef north of Bermuda. But the military authorities were fully prepared for such an event. More than 500 patients and crew were transferred from the ship to the hospital, in a remarkable operation that occured without a single loss of life. January 1946. Control of the hospital passed from the US Army to the US Army Air Force when the AAF took over the operation of the entire base. What had been designated as the 221st Station Hospital became the 1389th Army Air Force Base Unit Hospital. Army and AAF medical staff merged, with the Army people being given indoctrination courses in the handling of flying personnel, and a familiarization of AAF medical policies. January 1946. Staff at the 150-bed hospital found themselves with a serious problem. Their building, completed in 1943, was physically deteriorating. An engineer who inspected the hospital stated that the life span of the unit would be short because of a weakening of the basic structure. Walls and ceilings were cracking and chunks of concrete were falling away to expose rusting reinforcement rods. It was determined that one cause was the brackish water used for the preparation of concrete during construction. It was later also determined that galvanized iron was not used on the reinforcing rods as should have been the case during construction, only the reinforcing rod holders. Putting the combination of metals in contact with each other, along with the presence of some salt as a catalyst, caused a reaction which speeded up the oxidization of the ungalvanized metal. While all buildings on the base had some measure of salt in their concrete from brackish water or use of dredged materials, none had the mixture of metals the hospital did. Some rusting action had been obvious before the building had even been completed. March 23, 1946. When the SS Charles Carroll docked in St. George's with mechanical problems, the base hospital was called on to resolve a problem. There were 116 dogs on board, suffering from a distemper epidemic. They were disembarked and taken to Kindley. They were put in a stockade formerly used by members of the K-9 corps during the base construction and during World War 2. With no veterinarian then at the base, the medical staff elected to be medically responsible for the dogs, with excellent results. When the veterinarian arrived by air at the base a week later, 60 dogs had recovered or were doing well. When the veterinarian took over, all recovered except one that died. April 1946. An obstetrical department was installed at the hospital, with the furnishings supplied by the Officers' Wives' Club. April 16, 1946. The first baby was delivered in the new obstetrical department, a 7 lb 2 oz son born to Lt. and Mrs. Stong. It is believed this was the first baby born to a mother authorized to join her husband at an overseas Air Force station. June 1946. A small pediatric ward was set up, with the furnishings supplied by the Officers' Wives' Club. October 1946. The obstetrical department recorded its first premature birth. The child weighed 1 lb 14 oz at birth, but survived and did well. December 1946. The obstetrical department recorded its first Caesarian section. 1947. The deterioration of the hospital building had advanced so much that the south wing was condemned. It had housed medical detachment personnel on the first floor, and one 36-bed ward and one 42-bed ward on the second floor. 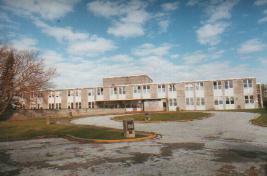 Plans were started for the remodeling of Building 200, at a cost of $219,000, for use as a 50-bed hospital. This building originally housed the medical detachment personnel. September 1947. At the height of an industrial dispute in Hamilton led by Dr. Gordon that led to all electricity being cut off island-wide including at Kindley and its hospital, a base surgeon successfully performed an emergency appendectomy on a 10-year old Kindley boy. Late 1947. A crash and convalescent ward was established in Building 200, as a 30-bed unit. 1947 to 1954. Hundreds of US babies, children of USAF personnel based in Bermuda were born at this crumbling base hospital, the only North American military hospital in Bermuda. If with a Bermudian parent, the child was Bermudian. If without a Bermudian parent, the child was not a Bermudian and American parents were given a document issued by the US Department of State stating that the child was American, born on a US military base in Bermuda. 1949. It was not until then that authorization and funds for the complete conversion of Building 200 were received. October 1950. The job of converting Building 200 into a 52-bed hospital was complete. Patients, supplies, equipment and staff made the move in November 1950 from the 7-year old hospital building whose state of deterioration was advancing rapidly. That big structure stood empty for more than three additional years. December 1953. The old hospital was finally demolished, at a cost of $265,000. It had become too much of a liability. Its beams, concrete and other structures were riddled with rust and related problems, not only apparently with sea water instead of fresh water used for building, but also using shoddy construction techniques. New Kindley Air Force Base Hospital 1956. The black and white USAF photographs above are from US National Archives and kindly sent in February 2012 by the family of Captain Christian M. Cotham, Jr, USAF, stationed at Kindley AFB Bermuda 1952-55. July 1954. Work began, on the same site as the demolished hospital, of a new 50-bed hospital, at a cost to US taxpayers of $1.70 million. 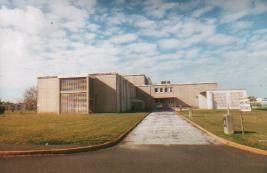 It was of modern design, up to latest US military hospital standards, expandable to 100 beds in an emergency. 70% of the area directly serving patients was air-conditioned and the latest of inter-communications systems was installed. May 1956. New hospital was completed after taking nearly two years to build, with the move from Building 200 finished by May 12. The dental clinic remained in Building 200. June 21, 1956. KAFB celebrated a major event, with Bermudian help. The occasion was the official dedication of the brand-new base hospital (see photos at top of this file) just west of what used to be the Kindley AFB school. At this time it had an authorized staff of seven physicians, four dentists, nine nurses, one veterinarian, 72 medical airmen and four Medical Service Corps officers. Vanguard Construction of the USA built the new building. It had taken almost two years to build, mostly with Bermudian labor, with the complete interior decoration work undertaken by the Front Street, Hamilton firm of A. S. Cooper & Sons Ltd. The grand opening was held under sunny skies outside the hospital's main entrance. It was attended by His Excellency, Governor Sir John Woodall; a delegation from the USA including Dr. Frank B. Berry, then Assistant Secretary of Defense (Health and Medical); Major General W. H. Powell, Jr., Deputy Surgeon General, United States Air Force; and the Honorable J. B. Pine, the United States Attorney General. Also in attendance were the Hon. Sir John Cox, then the Speaker of the Bermuda House of Assembly, the Venerable Archdeacon Stowe, who performed the Invocation and the Right Reverend Robert S. Dehler, Roman Catholic Bishop of Bermuda, who performed the Benediction. It was designated as the USAF's 1604th Hospital. Speaking after the Governor's remarks, Dr. Berry stated it was a pleasure to see the hospital completed and said: "I hope it will become a symbol of mercy to you in Bermuda. We will always provide for you as for our own in case of need, although we pray it may never happen. I am sure we will always be willing to render aid to you in Bermuda and to the United Kingdom military, our brothers in arms." The attending guests were entertained at tea and then toured the three floors of the new hospital. Kindley Air Force Base Hospital completed in 1956. The black and white USAF photographs above are from US National Archives and kindly sent in February 2012 by the family of Captain Christian M. Cotham, Jr, USAF, stationed at Kindley AFB Bermuda 1952-55. 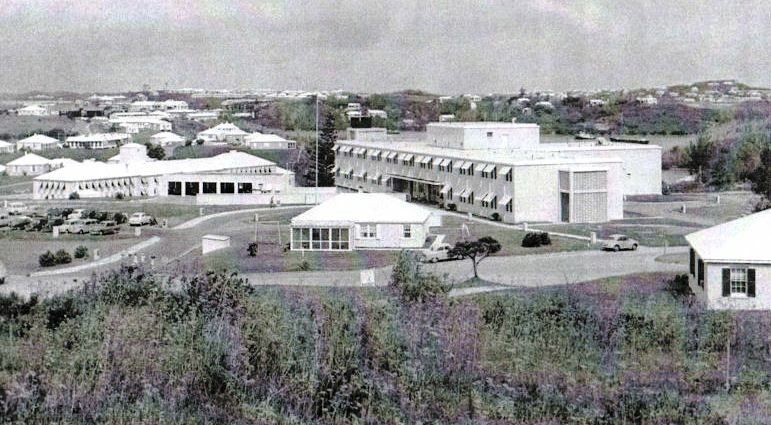 From 1956 until it wound down in 1967, hundreds of USAF (to 1970) or US Navy or US Marines or US Coastguard babies were born at this base hospital, the only North American military hospital in Bermuda. If with a Bermudian parent, the child was Bermudian. If without a Bermudian parent, the child was not a Bermudian and American parents were given a document issued by the US Department of State stating that the child was American, born on a US military base in Bermuda. October 1962. It received its Certificate of Accreditation from the Joint Commission on Accreditation of Hospitals in the USA. March 1966. The Dental Clinic received its accreditation from the Council on Hospital Dental Services of the American Dental Association. 1966. Although the hospital continued to give modern and efficient care to Kindley personnel, it was downgraded to a 25-bed hospital. 1967. The new hospital was downgraded to a dispensary. After that, the medical doctors and nurses were withdrawn, all births of the Kindley Air Force Base personnel stationed there were sent to the civilian King Edward VII Memorial Hospital in Bermuda. 1967-1970, MSgt Maurice J. Thibeault was stationed at Kindley AFB with the 1604th Hospital Unit. He was accompanied by his British-born wife Shirley and their three children. Their son Greg wrote this on March 1, 2019: "My parents lived being stationed in Bermuda. They have said it was their favorite assignment together. We lived on a hill next door to the NCO club.My father retired from the USAF in 1982 after serving for 30 years. Unfortunately, he passed away in 2001. My mother resides in Fitchburg, MA. She and I plan to visit Bermuda in a few weeks. The highlight of the trip will be going to see the former base area and reminisce. " The former Annex Clinic closed earlier that year. This clinic lasted until 1995 when it too closed when the two bases were closed. The premises have since been demolished and replaced by the all-civilian Lamb Foggo Urgent Care Centre (St. David's Health Centre).